Rakhi festival encompasses the warmth shared between the siblings. The values and the sentiments attached to the rituals of this festival are worth inculcating by the whole human race, the sentiments of harmony and peaceful coexistence. This festival is well known for manifesting a strong bond between brothers and sisters. The Rakhi thali is decorated to celebrate this eternal bond of love between brother and sister. 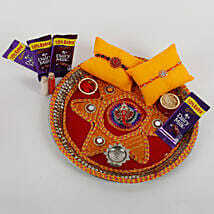 Sisters can send the Rakhi Thali to their brothers to show their love and affection in a very stylish way. We offer exiting and unique Rakhi pooja thalis choice for the celebration of Raksha Bandhan. Hence, you can add special delight to this festival by sending attractive Rakhi pooja thali to Chennai and feel the happiness. Send Rakhi Pooja Thali to Chennai: Share this Excitement and Fun in an Affordable Way. 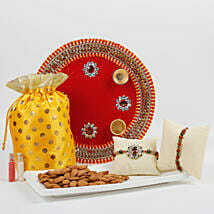 Sending Rakhi pooja thali are an extended expression of love and affection that the siblings share. All those sisters who can't meet their brothers, can send Rakhi pooja thali to Chennai with their hearty wishes and love. Our website include the unique and beautiful sets of attractive Rakhi pooja thalis to cherish the moment more with your loved ones living in any part of the India. This symbolizes her love and affection for his brother. It is auspicious occasion which is celebrated to thrill the immortal bond of care, respect and warmth between the sisters and brothers our website’s Rakhi pooja thali delivery in Chennai is prompt and safest delivery. Our website offers you online Rakhi delivery in India same day. So, strengthen the bond between brothers and sisters by sending Rakhi pooja thali. We understand the significance of Raksha bandhan in your life and strive to make it memorable to the best of our ability.